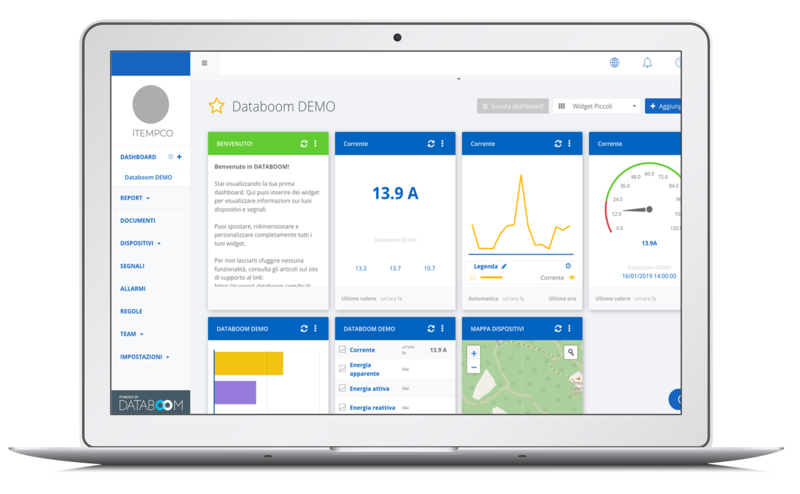 iTempco is a Web Application based on the DataBoom platform that provides real time condition monitoring of a plant and the management of big data related to industrial plants, allowing to take more smart and informed decisions about your business. iTempco allows to change the set-points and other configuration parameters and to know when a service intervention is required, also making possible the planning of data driven predictive maintenance. iTempco offers a series of thermodynamic tools including conversion of unit of measurement and temperature analysis, thermal exchange surface evaluation for heat exchangers and thermal machines. iTempco is a thermodynamic app, a useful tool whenever working with thermoregulating units, dealing with heating, cooling and refrigeration needs, cogeneration and power generation plants, chemical plants and waste water treatment, and generally with any issue related to thermal energy management in production process industrial plants. How to access and consult iTempco? iTempco can be accessed via any kind of browser with an internet connection via https. A simple hardware component is supplied, an eWon interface device providing the connectivity to the plant, retrieving all the data aimed to feed the iTempco dashboard. The user will have to make available an internet access through an enterprise network or a dedicated mobile internet card. The eWon device sends the data to a defined address, using the TCP 8080 port through http (only out stream data towards the DataBoom requires the opening of the TCP 8080 port for the out stream toward internet). The eWon device connects through VPN using the UDP 1194 port or the TCP 443 to the VPN*.talk2m.com server (VPN towards talk2m in which also goes the data stream directed to the iTempco dashboard, requires the opening of one of the two specified ports). The eWon device connects through VPN using the TCP 443 port to the VPN*.talk2m.com server using a proxy server, also with authentication (this is the most secure and transparent mode if you have a proxy server for internet routing. It is employed to get data out from very protected and secure networks such as in insurance companies or banks using a dashboard for electrical consumption monitoring). Use the account details provided with the contract to access the iTempco platform for plants monitoring, data arrangement using the several configurable widgets available, visualization of the informations in a chronological order or in statistical data sheets. The system allows to create real time reports.